Our Products >> COLLECTIBLE AMMO, Current & Obsolete, All Countries. >> SINGLE Collectible Cartridges, Currect & Obsolete, All Countries >> PISTOL Calibers, Single Cartridges, All Countries. >> "INCH" Caliber Pistol Single Cartridges >> .500 JRH, Jack Huttington, Single Cartridges >> .500 JRH, JHP, One Cartridge not a box! 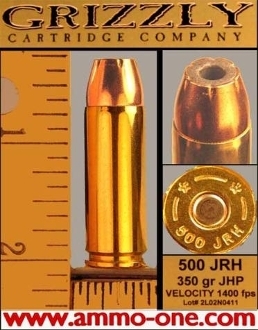 One Cartridge: .500 JRH (aka 500 S&W Short) by Grizzly Cartridge Company, factory loaded using new Starline brass with a "*∩* 500 JRH”" Head-Stamp and loaded with a350 grain J.S.P. (Jacketed Soft point) projectile. History of the .500 JRHCartridge: Invented by Jack Huttington before 2008? Another big bore Handgun Cartridge. From American Hangunner: "Trying to decide which came first, Huntington's .500 JRH or the Smith & Wesson .500 Magnum may be a chicken or egg first argument. It's sufficient to say that currently the .500 JRH is basically a .500 S&W Magnum cartridge cut to approximately 1.40"
.500 JRH, JHP, One Cartridge not a box!